A drone that hovers over Japanese employees and blares music to force them to go home was unveiled Thursday, as the country tries to reduce its notoriously long work hours. This handout image grab taken from a video provided by Japanese company Blue Innovation on December 7, 2017 shows a T-Frend indoor drone inside an office in Tokyo. 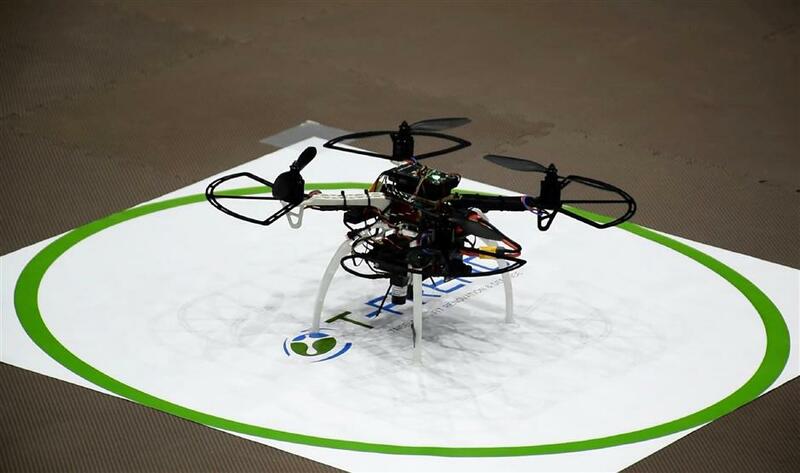 A drone that hovers over Japanese employees and blares music at them to force them to go home was unveiled on December 7, as the country tries to reduce its notoriously long work hours. The "T-Frend" buzzes over those trying to work late, blasting out the strains of "Auld Lang Syne", a Scottish tune typically used in Japan to announce that a store is closing. "You can't really work when you think 'it's coming over any time now' and hear 'Auld Lang Syne' along with the buzz," said Norihiro Kato, a director at Taisei, an office security and cleaning firm that co-developed the system. The drone is equipped with a camera, which stores footage on an SD card. Office scenes can also be monitored almost in real time from a remote location. The machine recognises its location on a building floor without GPS. It takes off from its port, makes a surveillance flight on a pre-set path and then returns autonomously. Taisei plans to start the T-Frend service in April in collaboration with drone system developer Blue Innovation and telecoms operator NTT East. The fee for the service is yet to be officially set but "the target price" is around 500,000 yen ($4,500) a month, said Kato. T-Frend's developers are also studying the possibility of giving the drone facial recognition technology to tell who is in the office after hours or whether there is an intruder. Administrative officials at many companies push overtimers out of the door but this has ironically resulted in these officials working overtime themselves, to say nothing of "causing friction between employees", the companies said in a statement. Firms have therefore turned to security companies for this task, but they have struggled to provide enough staff given a nationwide labour shortage in Japan. T-Frend therefore serves the twin function of reducing overtime and making up for this labour shortage, the firms claimed. Japan's government has been trying to change a culture in which working long hours is perceived as proof of loyalty and dedication. Every year in Japan, long working hours are blamed for dozens of deaths due to strokes, heart attacks and suicides. In February, the country launched the "Premium Friday" programme, urging employees to knock off early on the last Friday of the month with the aim of both reducing work hours and invigorating spending. But the plan fell flat with many claiming the last Friday of the month is one of their busiest days.